I'm super thrilled humbled and honored to be included in this years MAI Invitational Exhibit at the Vanderbilt Fine Arts Gallery at Vanderbilt University in Nashville. Thank you SAMA and I am thrilled to be in the company of such talented colleagues!!! 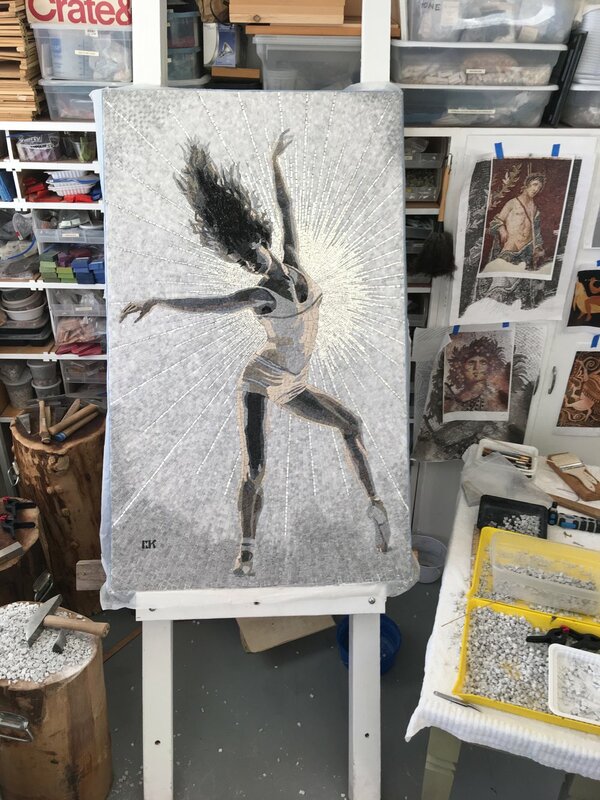 Vanderbilt Fine Arts Gallery is pleased to present Embodied, the 2019 Mosaic Arts International exhibition, surveying figurative works by six renowned mosaic artists working today: Lilian Broca, Shug Jones, Michael Kruzich, Atsuko Laskaris, and Carol Shelkin. The exhibition is part of the Mosaic Arts International 2019 exhibition series held in conjunction with this year’s American Mosaic Summit, taking place in Nashville from April 23 through 28. The contemporary mosaics on view aim to capture the personal histories, preserved memories, the emotional occurrences of everyday life. Through meticulous manipulations of glass, stone, and ceramic, these detailed works achieve a dynamic range of color, texture, and reflectivity. Their durable materials and methods do not stray far from those from antiquity. Neither do their stories: Scenes presented in Embodied share timeless themes of love and family, conflict and war, spirituality and society. This exhibition is supported in part by the Society of American Mosaic Artists. Since 1999, SAMA has presented programs, publications, events and exhibitions that promote, educate and inspire excellence in mosaic arts. Mosaic Arts International is the longest running annual juried exhibition showcasing mosaic art in the world. 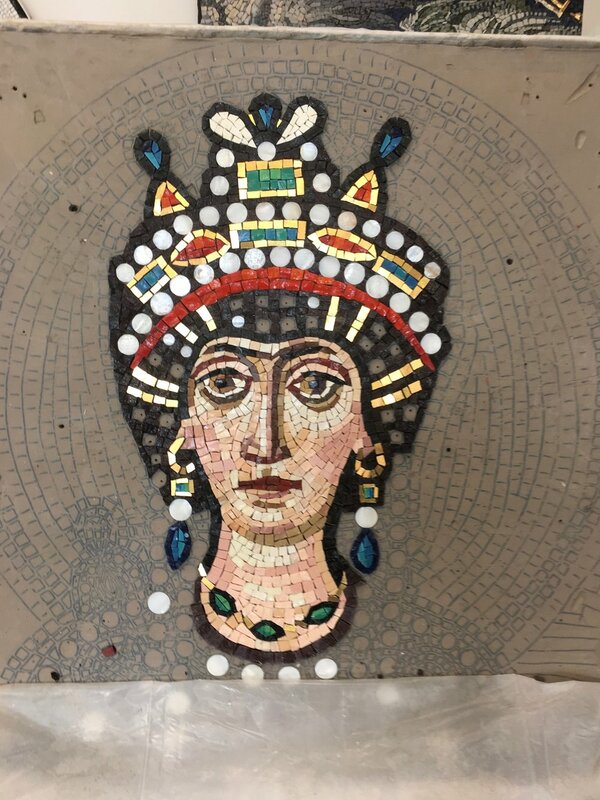 The American Mosaic Summit will be held at the Sheraton Music City Hotel in Nashville from April 23 – 28, 2019, as well as the 2019 Mosaic Arts International Juried Fine Art Exhibition, on view at the Parthenon Museum, and the Mosaic Arts International Juried Architectural & Site-Specific Exhibition, on view at the Nashville Public Library, Main Branch Art Gallery through May 19, 2019. Find more information, as well as registration information, here. I recently went through something that I thought was interesting enough (or horrific enough depending on how you look at it) of writing about. For those who like to muse about why I still periodically do reproductions of ancient mosaics: the real answer is because I WANT to. I enjoy it and it makes me happy; semplicamente. But recently something happened which revealed a hidden benefit. I had a rather large commission (5’x3’) that, once done in Ravenna Method had to be glued and “flipped”. This is a process I am very familiar and used to. 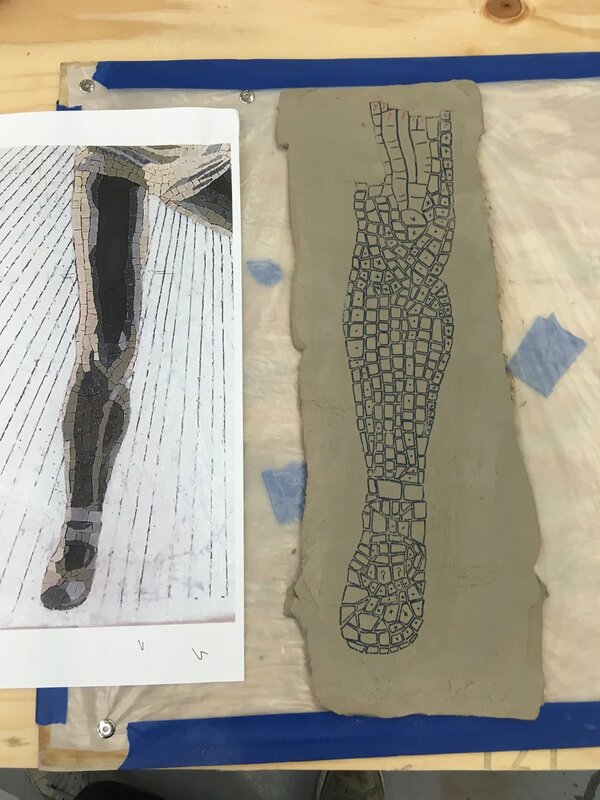 However, during the flip there was a physical slip and the mosaic was impacted in a way that displaced and destroyed the subject’s right lower leg. Needless to say I was nauseated and absolutely beside myself. Then I realized that all of that reproduction work I have done over the years was going to come in handy. Not that it lessened my disappointment in the mishap, but since I had photos of what it was finished, I would be able to reproduce my own work in the same way I had done for ancient mosaics so many times. Everything we learn comes in handy somewhere and you never know when doing what speaks to YOU as an artist (and not someone else) is going to pay off when disaster strikes. Stay true to what calls to you. Google Signage Commission for new building in Mountainview with a Moroccan-esque design theme. They designed it and wanted to hire a mosaic artist to give it a hand-made look with imperfections here and there to give a tapestry-like impression. Every tesserae is hand cut from unglazed porcelain tiles. 4' x 7'. Will be place on wall behind reception desk, but no idea when the building will be done; I think sometime this fall. It was a great honor to be present at the 5th Biennale RavennaMosiaco festival in October! I was thrilled to have my work included with so many superstars of the mosaic world. But the best part was meeting colleagues and friends from all over the world converging on the little town of Ravenna, Italy to celebrate the ancient and ever-evolving medium of mosaic! Grazie mille to the AIMC panel for choosing my work to participate! A moment I will always remember! "La Primavera" selected for Ravenna Mosaic Biennale Festival!!! I am super excited and honored that my work "La Primavera" has been selected to travel to Ravenna for the RavennaMosaico 2017 Biennale di Mosaico exhibition: Opere dal Mondo October 7-November 26, 2017!I can't even tell you what a dream-come-true this honor is to have a work of mine represent me in the city where my mosaic training and roots began! We hereby are very happy to give you notice that your work has been selected to participate at the Exhibition OPERE DAL MONDO 2017 that will take place in Ravenna at Chiostri Francescani from October the 7th to November the 26th, in the framework of RavennaMosaico 2017, Rassegna Biennale di Mosaico Contemporaneo promoted by Comune of Ravenna and by Associazione Internazionale Mosaicisti Contemporanei (AIMC). As soon as possible we’ll send to you all the instructions to send us your work. Congratulating with you we send you our best regards. I have the honor of being invited to participate in the pilot program of an amazing 17-day Residency and Exhibition in Venice, Italia. The theme will be "West meets East/ East meets West" and is centered on creating work beside other artists of different disciplines at the Arsenale Docks , then followed by an exhibition paralleling the 57th Venice Biennale . I am trying to raise the funds required to participate which include studio space, lodging, air-fare, materials, shipping and living expenses while there. As a mosaic artist this is a dream for me and an opportunity I very much want to take advantage of. Can you imagine getting to go to the studio every day to create mosaics in this magical city for two weeks! My excitement at being able to participate in this residency would only be matched by my gratitude towards all who can contribute, no matter how small or large, or even moral support towards making this a possibility. $3000+ donation owns one of these works of mine, or one of the Venetian works created if not sold, $500 + a signed poster of work of your choice, $200+ 12-set of postcards of my work, $100+ 6 postcards, under $100 a postcard and ❤! Warmest of regards and thank you! Time for the Empress to join her Emperor! "Still Beating" Installed at Linked-in new building! 222 2nd Street, San Francisco! I am happy and honored to announce that my sculptural mosaic Heart "Still Beating" has been installed in the lobby of the new Linked-in Building in downtown San Francisco! 222 2nd Street is the address! The building has a colossal public space as well as well as a public lobby. The Heart-work can be seen in the lobby or from the street through windows. the building has a massive open public space with tables chairs and lots of fresh air! Just a little break before they and 7 other guys hoist this 650 lb baby up a short flight of stairs. I WISH I had videoed that! Incredible! ...And now some gratuitous shots of the happy father posing by his baby! LOL! "Still Beating" selected for Ghirardelli Chocolate Bars-"Twilight Delight"! We’re so pleased to share that your 2015 Hearts Sculpture was selected for one of three 2016 Ghirardelli Chocolate Bars featuring Hearts in San Francisco and supporting San Francisco General Hospital Foundation. During February, a portion of each chocolate bar sale at Ghirardelli store locations will benefit the Foundation—store locations below. Chocolate bars are also available at The Cellar at Macy’s Union Square and 1oo% of each chocolate bar sale at Macy’s will be donated back to the Foundation. Attached you’ll find a PDF of Macy’s promotional signage and this year’s chocolate bar designs. We’ll be promoting on Foundation Facebook and Twitter throughout the month. We are very pleased to inform you that your work, La Primavera, has been selected to be included in the Mosaic Arts International 2016: Fine Art exhibition at Women’s Museum of California at Liberty Station in San Diego, CA. We received over 200 entries from artists all over the world. The 2016 Jurors, Elaine M. Goodwin, Sherri Warner Hunter, and Bernice Steinbaum, carefully considered every piece. Their dedicated work culminated in the selection of 35 works for inclusion in the MAI Fine Art exhibition to be held from March 30 – May 27, 2016. Congratulations! This complete resource of mosaic techniques and design ideas is sure to become your go-to reference. With clear step-by-step sequences, mosaic artist Bonnie Fitzgerald shows how to draw up an idea, cut and arrange tiles, and lay designs successfully. All tools, materials, and equipment are clearly explained, and you'll find helpful hints on setting up a comfortable workspace, as well as essential information on installing your finished mosaics. "Still Beating" is a large-scale sculptural mosaic created for the Hearts for San Francisco Program benefitting the Trauma Center at San Francisco General Hospital. It represents aproximately 930 hours of work and over 54,500 hand-cut and laid tesserae in natural stone, Italian smalti, 24-k gold and Swarovski crystals. It lives at the corner of Geary and Powell streets in Union Square, San Francisco through October 2015.